Tandoori spiced chicken, sautéed onions, pepper, tomato, and cilantro, mint sauce, wrapped in a flour tortilla. Tandoor spiced chicken salad, lettuce, tomato, pepper, Jalapeño, onion, cilantro mint aioli, cheddar, on a ciabatta roll. Scrambled eggs, cheddar cheese, spinach, and tomato, Wrapped in a flour tortilla. All Omelets served with toasted bread, potato of the day, grilled tomato. Egg white only add $1.00 extra. Tomato soup, lentil soup, and vegetable soup. 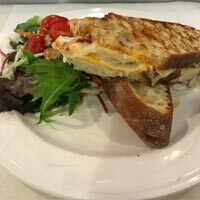 All Panini served with your choice of a green salad, potato salad, bag of chips or cup of soup. Roasted chicken breast, provolone, arugula, tomato, pesto aioli, on ciabatta roll. 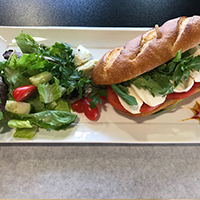 Fresh mozzarella, tomato, basil, arugula, sundried tomato & olive tapanade on a baguette. Salami, prosciutto, fontina, sundried tomato & olive tapanade on sliced ciabatta. Roasted turkey, bacon, Swiss, avocado, Dijon aioli, on a ciabatta roll. House made beef & pork meatballs, provolone, asiago, on a garlic buttered ciabatta roll. Provolone, brie, fontina, grilled onions, sundried tomato & olive tapanade on sliced ciabatta. House made chicken salad with cranberries & bacon, brie, lettuce, tomato on a ciabatta roll. 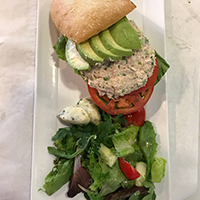 Tuna salad, lettuce, tomato, avocado, on a ciabatta. Grilled eggplant, zucchini, grilled onions, fontina, sundried tomato & olive tapenade, on sliced ciabatta. 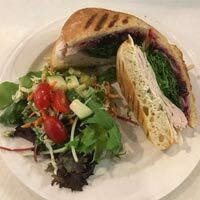 Roasted turkey, Swiss, cranberry sauce, grilled onion, arugula, lemon aioli, on a ciabatta roll. 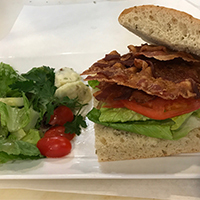 Applewood smoked bacon, avocado, tomato, lettuce, lemon aioli, on rosemary focaccia. Roast beef, cheddar, Applewood bacon, chipotle aioli, on sliced ciabatta. 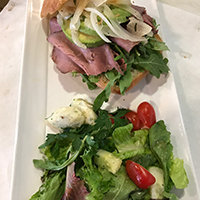 Roast beef, caramelized onions, arugula, avocado, chipotle aioli, on a ciabatta roll. 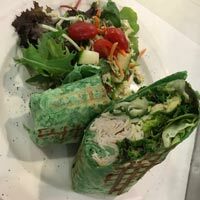 Roasted turkey breast, provolone, avocado, sun dried tomatoes, spring mixed greens, pesto sauce wrapped in a spinach tortilla. Tuna salad, provolone, avocado, and tomato, on sliced ciabatta. Mixed greens, tomato, cucumber, creamy herb vinaigrette. Pressed, brought to you by Prabh Indian Kitchen, welcomes all with a passion for delicious food to a pleasant dining experience.Prabh Indian Kitchen has been serving Marin County for 4 years.